Product designed to take care of plastic and wooden parts of a car compartment. Efficient product designed to clean and refresh parts in a car compartment (control panel and other plastics, wooden, leather and vinyl parts). Efficiently cleans the surfaces from contaminations and protects them from cracking. Easily penetrates into the smallest scratches on the surface of the parts and removes dirt. 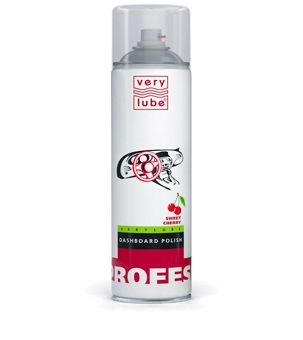 Refreshes the appearance of plastic and wooden surfaces and makes them shine. Gives anti-static properties to the surface, thus, it gets less dirty and dusty. Does not leave any greasy film after usage. Prevents plastics from cracking and its fading in the sun. 2. Spray a small amount of the product onto the surface to be cleaned. Does not require a long-term polishing. If with time the shine is gone, wipe the dashboard with a cloth again (without the polisher). The shine will reappear.